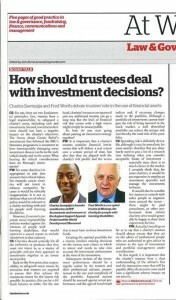 The issue of how to make the ‘right’ investment decisions is something that many trustees regularly have to deal with. In a recent article in the Third Sector magazine, I debated this issue with a sector colleague, Fred Worth, co-opted Trustee of Mencap, and have included some of the ideas discussed below. For me, a charity’s investment decisions should be guided by two fundamental principles: first that the trustees have a legal responsibility to safeguard the assets of the charity, including cash and investments. By extension, they are required to ensure that they achieve the maximum return for the lowest risk possible. In practice, this can be a difficult balance to strike. On the one hand, charities’ resources are squeezed and any additional income (especially unrestricted) can go a long way. But the level of financial risk that comes with a high return may simply be unacceptable. Second, any investment decisions made should promote the charity’s objectives, and not have a negative impact on the charity’s objectives. The reputational damage arising from investment decisions that don’t fit in with the charitable aims of the organisation are immeasurable. The recent media frenzy about Comic Relief’s investments (following the BBC’s Panorama programme, All In a Good Cause), is testimony how damaging some investment choices that the trustees make be on the charity and on the sector. In practice, there’re some steps that trustees can take to help them manage the charity’s investments responsibly. Put the charity’s approach to investments in an Investment Policy.